When I went to India for a public health internship, I knew one of the things I wanted to do in my free time was take a motorcycle trip. We always love to rent motorcycles and scooters when we travel because of the independence it allows. It lets us see the full extent of the landscapes around us, rather than just the pinhole view that bus or train windows allow, and it lets us stop whenever we want – to take photos, to rest, to just enjoy where we are. A motorcycle or scooter means being free to travel wherever we please and able to get off the beaten path. So in my final week in India, as I was looking for the ideal motorcycle ride, it seemed only fitting that I get as far as possible from the places I’d already gotten to know (the desert plains of Rajasthan) and experience the country as independently as I could. Looking for something budget-friendly and relatively accessible, I decided to base myself in Manali, a town at the foot of the Himalayas near India’s border with Pakistan. It’s a place that’s become popular with backpackers, but also with those seeking adventure in the high peaks outside of town. I rented a motorcycle near Manali to ride the Manali-Leh Highway to the top of Rohtang Pass, a name that alarmingly translates to “pile of corpses.” It’s not the easiest place to ride, but it definitely offers some of the finest views in India – and since it only takes half a day round-trip, it fit nicely into my cramped schedule. I did the trip in August, but it can be done any time from early May through the end of October; snow covers the mountain during the rest of the year, and the road is closed. 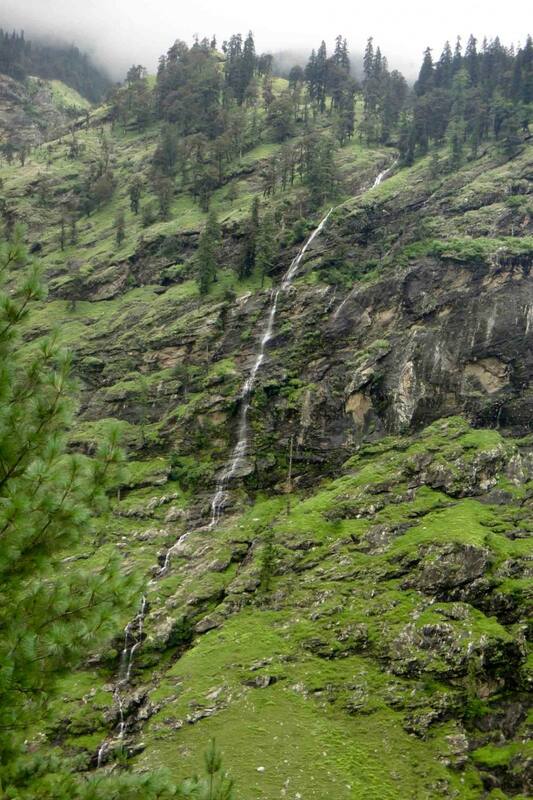 India may be famous for its cheap and extensive railways, but Manali is one location that can’t be reached by train. The best option is the Volvo Luxury Bus from Delhi, a 13-hour overnight ride that costs under $15. “Luxury” only refers to the size of the plush seats, though. The Himalayan roads make for a rough ride, and some of the curvier sections inevitably lead to motion sickness (the bus companies know this and equip all seats with a sickness bag). Manali came to prominence as a hill station, the name for towns British colonists visited to escape the oppressive heat of Indian summers. 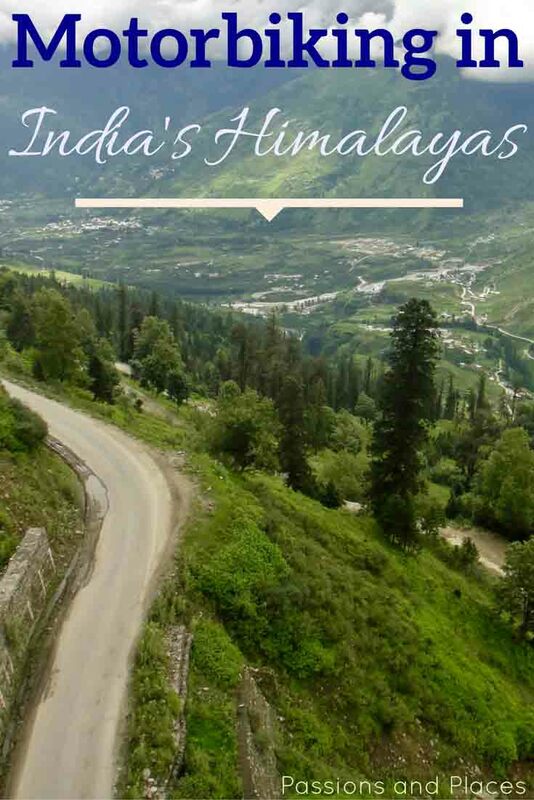 Since India’s independence, Manali has transformed itself into a tourist hotspot for those seeking outdoor adventure (hiking, downhill skiing, paragliding, zorbing, and of course, motorcycle touring). 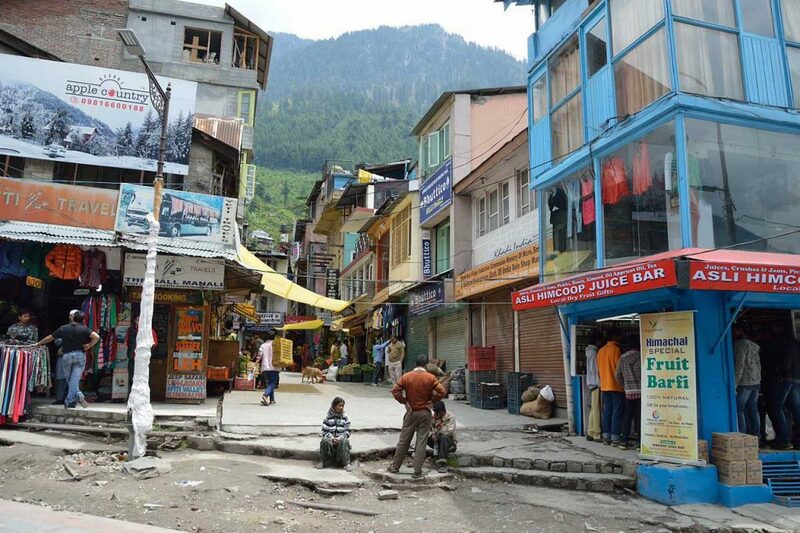 One of the most interesting areas of town to explore is the main walkway, the Manali Mall, which is lined with stalls selling food and goods. Many of the town’s residents are actually Tibetan, so the Mall is filled with their delicious food and colorful tapestries, which you won’t find in other regions of India. 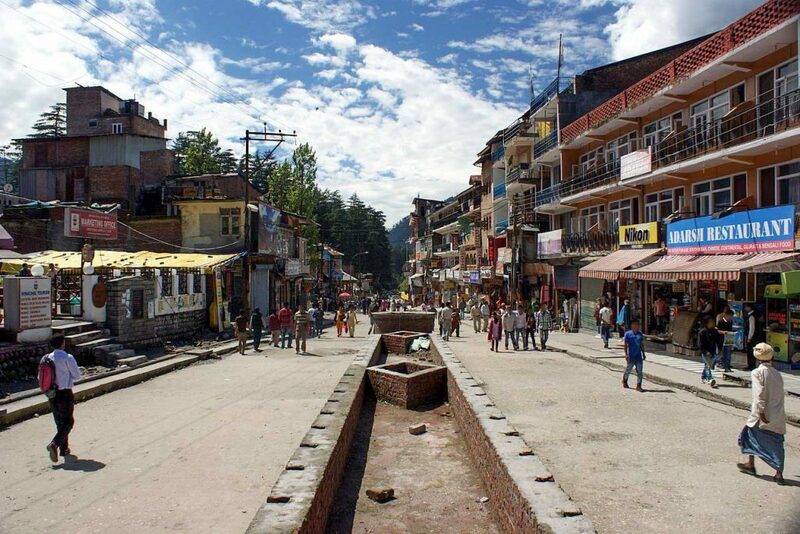 The section of town known as Old Manali, 1.5 miles northwest of the Manali Mall, is another popular area where many guesthouses are located. Here you can find restaurants serving British, American, Italian, Thai, and Israeli cuisine (and everything in between). The crafts and other wares being sold here are far from authentic, but if you’re in need of food, sleep, or basic amenities, Old Manali probably has what you’re looking for. Most of the motorcycle rental companies are in Vashisht, just a couple miles down the road from Manali. Enfield Center Manali and Bike Rentals Manali have bikes that can get you up the mountain, and they also organize multi-day group tours to Leh. The most common motorcycle for rent at these shops is the Royal Enfield Bullet 500cc. I love these bikes because their appearance hasn’t changed much since the 1950s. There’s something nostalgic about them – reminding you that a motorcycle embodies the freedom of the open road and harkening back to a time when the world was less explored. The cost for a one-day rental is $20-$30, depending on the season (costs go down during the monsoons when fewer tourists visit). Prices are higher for non-Indian brands like Yamaha or Honda, though they’ll probably be newer and have better tires. Even if you’re not that well versed in motorcycle maintenance, it’s absolutely critical to do at least a basic inspection of the bike before heading off. When I was there, some of the bikes for rent in Vashisht had worn out tires that were cracked and completely smooth. 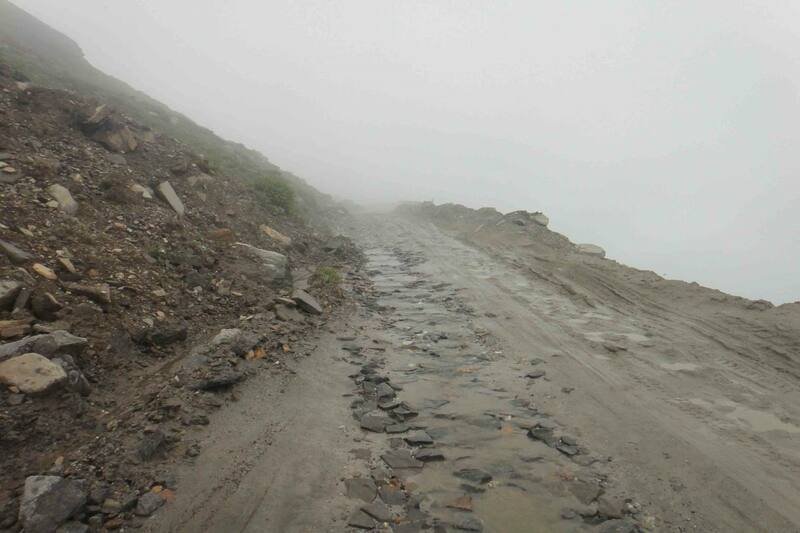 Large segments of the road to Rohtang Pass degrade into mud and gravel, and a smooth tire won’t get much traction. So make sure your bike has relatively new tires, and look for bikes with dirt bike tires if you can, though they’re usually only on the more expensive ones. Also check that nothing is loose on the bike, like a fender, fairing, or mirror; having parts fall off your motorcycle on a narrow road at 13,000 feet isn’t fun. It’s always important to have safety equipment on motorcycle trips, especially for rough rides like this one. All the rental companies I saw provided motorcycle helmets for the driver, and rented them for passengers. A sturdy helmet with a face shield is best, because the trucks on the Manali-Leh Highway kick up rocks, and you do not want one of those hitting you in the face. If you can find one, it’s also a good idea to rent a motorcycle jacket. Not only will it keep you warm, which is critically important near the summit, but it also gives you some protection from getting scraped up in a fall. Motorcycle gloves can be helpful too, as cold hands are not only uncomfortable, but also don’t operate the brakes and throttle as well as warm ones; for this trip, they’re really only vital near the beginning and the end of the riding season. I spent the night before the ride in Manali, which was helpful for acclimating to the altitude (the town is already a 6,000-foot rise from Delhi). 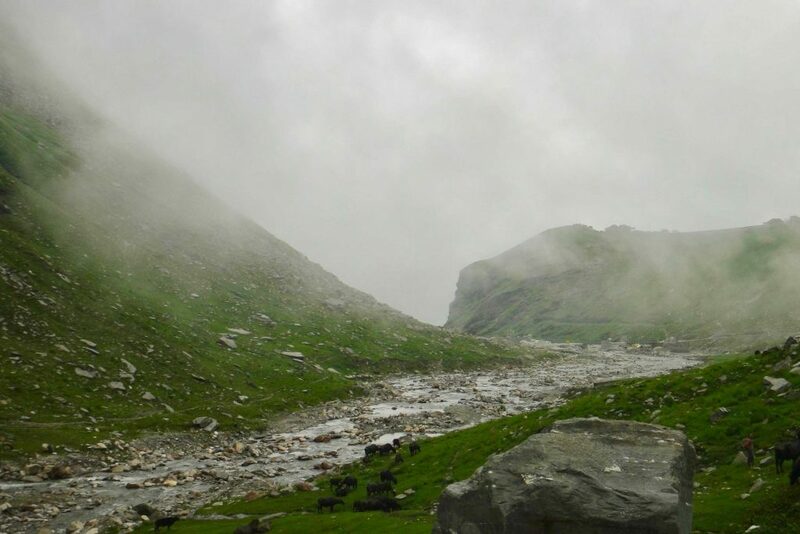 If you’re intending to go further than Rohtang Pass, you might want to rent your bike and then stay in the Solang Valley further up the road. There’s not much going on there and the hotels are more expensive, but its elevation of 8,500 feet will do more to acclimate you for the later sections of the trip that climb even higher. Important to note: There’s a checkpoint outside Manali that effectively closes the road to Rohtang Pass on Tuesdays from 9am to 6pm. However, if you pass the checkpoint before 9am, you can continue on the road, and you’ll have it almost completely to yourself. 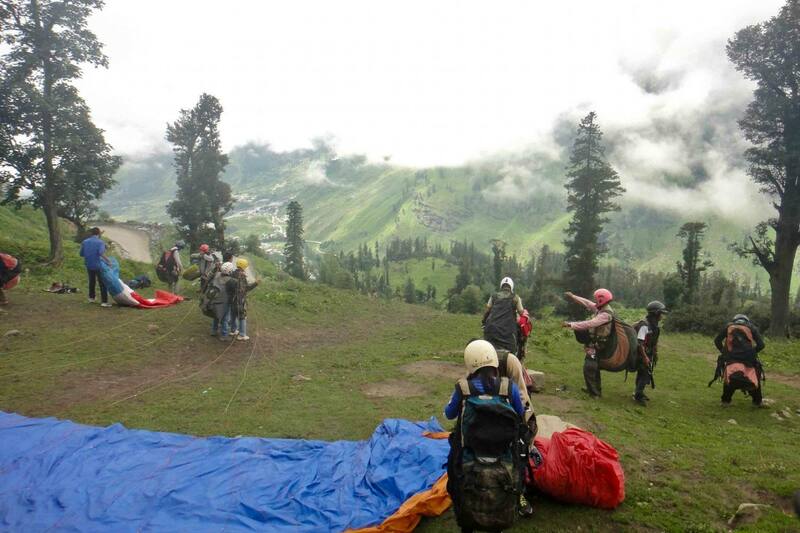 The first six miles from Vashisht to the Solang Valley is relatively flat. 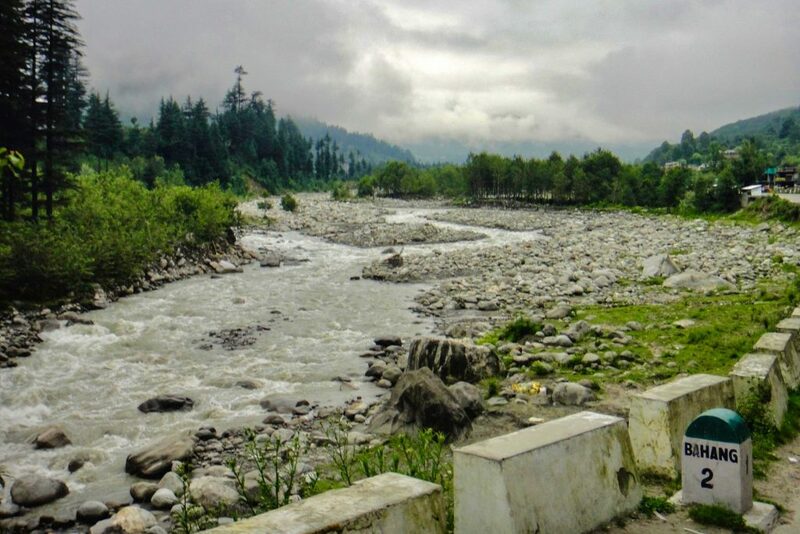 The road parallels the Beas River, and it’s easy to imagine how this boulder-filled waterway swells during the rains to allow for absolutely thrilling white-water rafting. For these first few miles, the road is in perfect condition, and you’ll wonder how this route earned its “pile of corpses” moniker. After Solang Valley, the road takes a turn and begins its ascent up the mountain with a series of switchbacks. The pavement is still unbroken here, and there are a couple of restaurants and guesthouses (the ones you might want to stay at if you’re planning to travel beyond Rohtang Pass) that give the area the appearance of civilization. Depending on the season, you may see paragliders sailing elegantly into the nearby fields; they jump from an area right off the road, just a few thousand feet above. 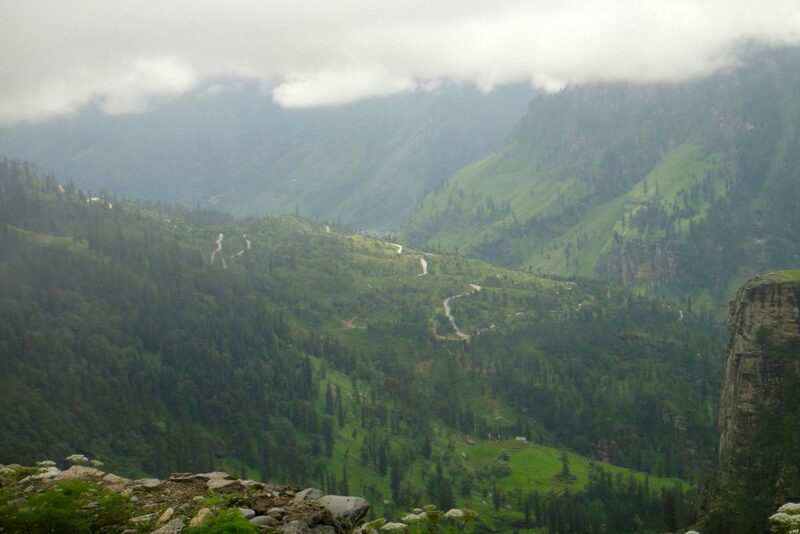 At the tenth mile marker from Vashisht, the switchbacks get much steeper, and the road gives a taste of its true character. 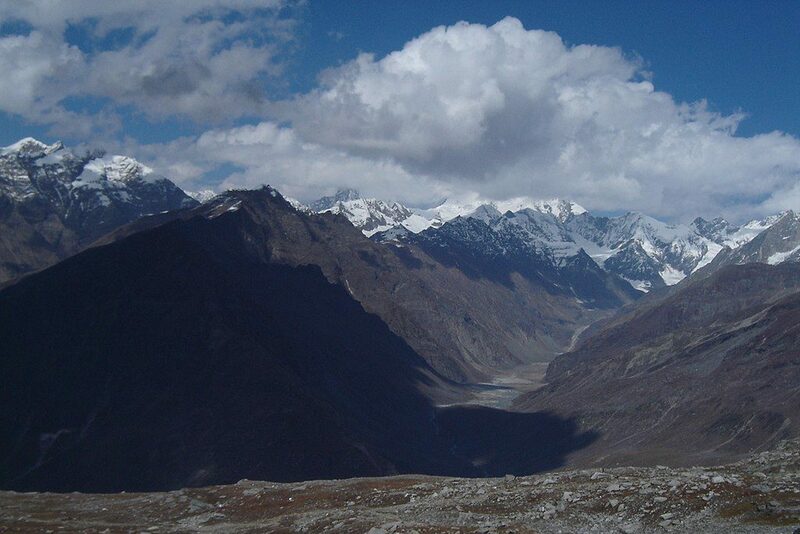 But this is also where you can see the majesty that is the Himalayas. Dozens of waterfalls cascade from the steep cliffs above, and the overlooks provide stunning vistas of the valley below. As you pass above tree line, the road becomes completely unpredictable. Some sections have near perfect pavement, making the fog the only impediment. But in other areas, the road is almost completely washed away, and the government doesn’t even attempt to maintain pavement, as it would need to be replaced yearly. Here, there’s only packed mud and the gravel left behind from rockslides, and workers can be seen removing troublesome stones by hand. The dense fog can make it impossible to see around the next bend, leaving you to ascend into the unknown of the clouds. Even if you’re an experienced rider, some struggling is likely in the unpaved sections; I’m not too proud to admit that my bike tipped over in the gelatinous mud more than once. The key is to keep calm, pick the bike back up, and restart it. With any luck, this will only happen a couple of times. 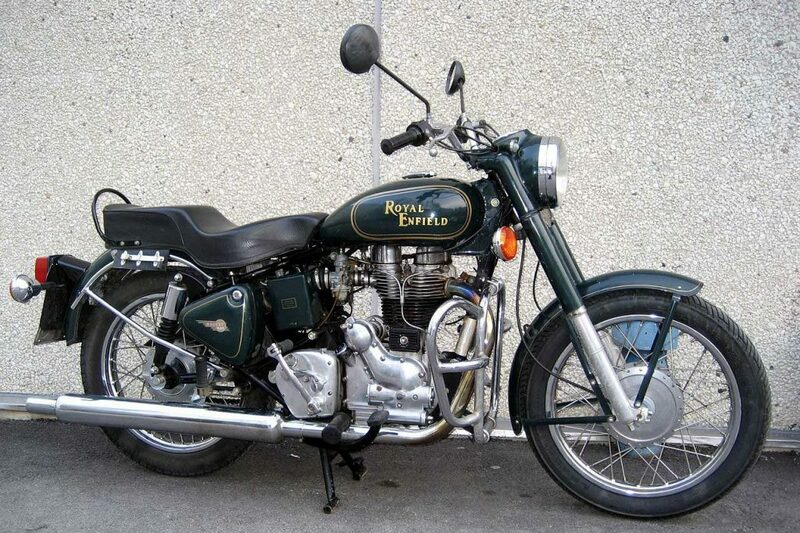 Royal Enfield motorcycles are incredibly reliable and usually start back up without issue, even covered in mud. Upon reaching the summit at Rohtang Pass, the road is impeccable, and the air becomes completely clear. The snow, rain, and fog found on the south side of the mountains are completely absent here, and the views go on for miles. The only thing spoiling the views might be the throngs of tourists who’ve reached the summit by jeep taxi, hopping out to take selfies – an unearned victory for them, given the grueling journey motorcyclists take to get here. The barren mountains beyond give a hint at the otherworldly landscapes that can be found further along the road to Leh. My limited time and the unpredictable weather of monsoon season prevented me from continuing on past Rohtang Pass, but the 300-mile, two- to three-day ride to Leh is considered one of most beautiful in all of India, if not the world. The road winds up and over even higher mountain passes than Rohtang, making altitude sickness an ever-present danger, and it crosses streams that require strong riding skills. Despite that, returning to India and riding to Leh is certainly near the top of my bucket list. There are great resources out there if you’re looking to do the trip before I get the chance to write about it. Unfortunately, I’m not sure how much longer the ride from Manali to Rohtang Pass will be possible. 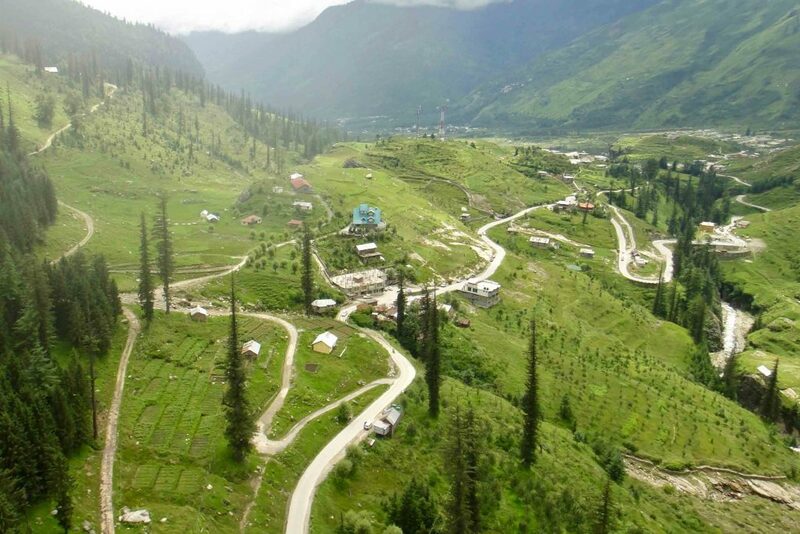 The Indian government is in the process of burrowing a tunnel through the mountain, which will cut the journey from Manali to Keylong on the other side of the pass from five hours to thirty minutes and eliminate most of the elevation gain. Given the high cost, I’m not sure if the government will keep the road over the pass open once the tunnel is completed in a few years (although the ride over the mountains from Keylong to Leh will remain the same). But the road should be an economic boon to the area, which is wonderful news for people living in the isolated towns on the north side of the mountains. 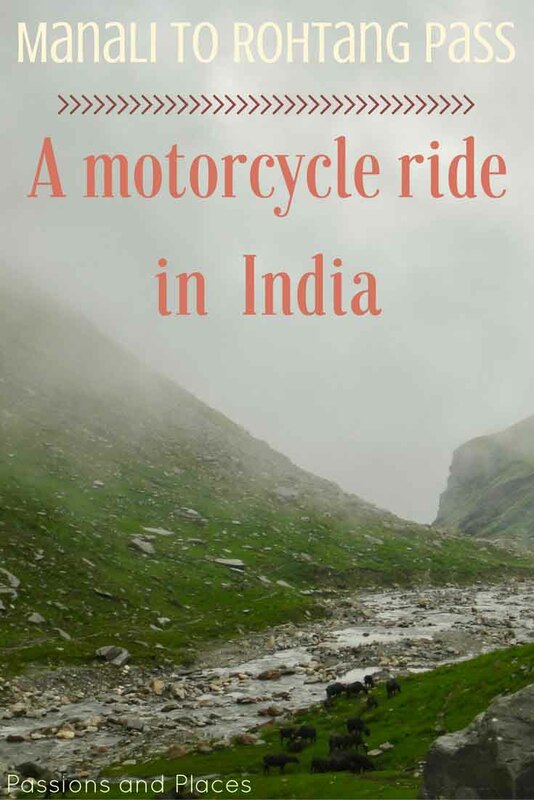 Have you taken any motorcycle trips in India? Thanks to Bike Bandit for generously sponsoring this post. As always, all opinions are our own. Manali bike riding is always gives pleasure and sigh of achievement. very well written bro. Thanks, I can’t wait to get back to Manali to do an even bigger bike trip! 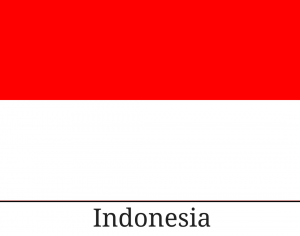 Really this motorcycle tour will be very thrilling & adventurous. It was one of the greatest adventures of my life. That’s completely understandable, and I do not recommend learning how to ride a motorcycle like the one in the post in a foreign country, especially one that’s known for aggressive drivers. I learned how to ride in the U.S. on a 200cc motorcycle – so maybe 50% more powerful than a Vespa. It’s always best to learn on something smaller and work your way up. Motorcycles and scooters are great because they let you experience the environment instead of just seeing it out a window. What an adventure!! This sounds so cool. I had no idea rentals were so cheap per day – for some reason I always figured a motorcycle would be more expensive to rent than a car! This is a great way to explore India, I’m going to look into it! Motorcycle rentals are definitely more expensive than car rentals in the US (because of insurance and less competition between companies). But in countries where motorcycles are more prevalent than cars, they’re really reasonably priced. It is a great way to see India! Wow, I am an Indian and it’s a shame I have still not started to ride bikes on the mountains. This is a very useful post. Most of Indian travelers are Himalaya enthusiasts. I learned about the trip through some Indian friends of mine in Udaipur who said the ride from Manali to Leh was one of the best experiences of their life. The Himalayas are truly amazing! We also love exploring places on a motorbike due to the freedom it gives you, you can just stop wherever looks good. We rented a bike at various places during our recent trip to Vietnam. I’ve heard that Vietnam has some pretty great motorcycles rides. I’m really hoping we can get there soon to do a few. Glad you enjoyed it! 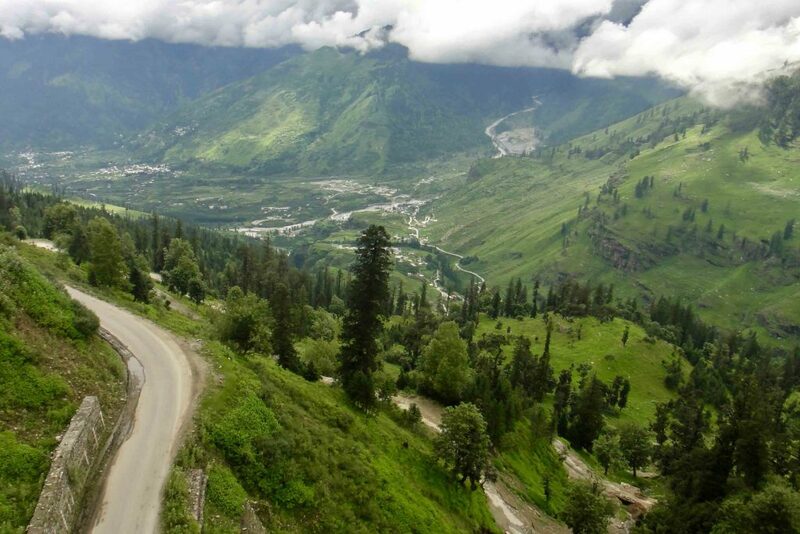 Whether you ride a motorcycle or not, Manali and the Himalayas are an amazing trip. India is at the top of my list. I really want to visit. I just rode a Vespa on a trip and now I’m hooked. This looks like a fantastic adventure and also a great way to see the countryside. Not to mention perhaps a better alternative to dodgy buses! Thanks for sharing. 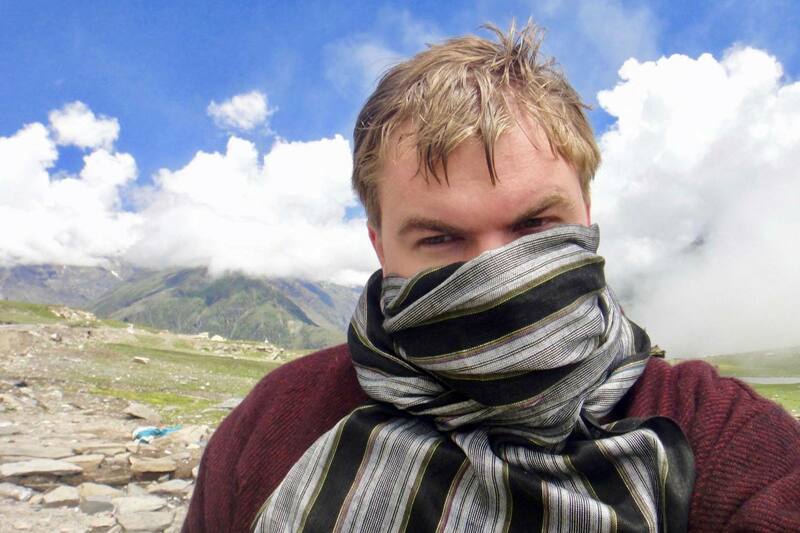 I highly recommend India, despite the problems that many other travelers mention. It’s a large country and I really only got to see the Manali area and the state of Rajasthan, so I hope to go back soon. Always excited to hear when people are learning to ride – it makes vacations a whole lot more exciting when you can rent a motorcycle or scooter!